Full Alphanumeric labeler has 20 bands with these characters. Please use the guide to dial desired message. <--> Click to see A/N read/print guide. This labeler has 2 lines of 10 characters each, all alpha/ numeric. 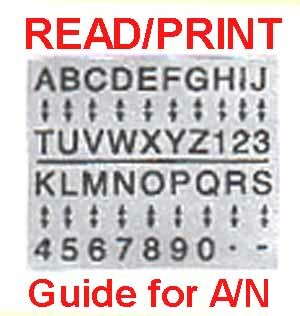 You may imprint any character A-Z, or number 0-9, or dot, or dash in any of the 20 print positions on the labeler. Great for highly variable data. This will help most users with Q.C., Product I.D., Freshness, batch, etc. This labeler does not have a $ or cents mark, so it may not be suitable for retail applications.